A team of researchers from the Moscow Institute of Physics and Technology (MIPT) and the Institute for Theoretical and Applied Electrodynamics (ITAE) of the Russian Academy of Sciences (RAS), in collaboration with a colleague from RIKEN (Institute for Physical and Chemical Research in Japan), has provided theoretical proof of the existence of a new class of materials. It was suggested that such systems be referred to as "spin-valley half-metals." The paper was published in the journal Physical Review Letters. The discovery will find use in implantable electronics, alongside devices based on graphene, nanotubes, and a number of other promising materials. The microscopic mechanism proposed by the researchers differs significantly from the usual half-metal model based on a strong electron-electron interaction. 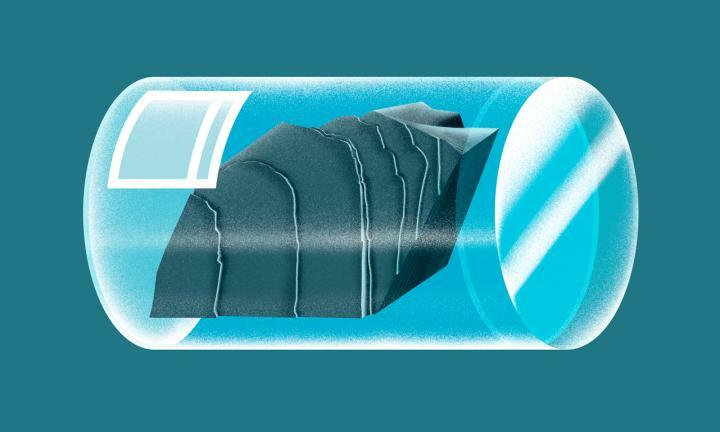 This might give rise to a new direction in search for "nonmetallic" half-metals, i.e., those that do not contain atoms of transition metals, such as nickel, manganese, and lanthanum. These would come in handy in implantable devices and systems. The authors use the term "spin-valley-tronics" to refer to the possible alternative to traditional electronics. Since the invention of the electron tube, the world has seen electronics exhaust most of its possibilities. It would be highly challenging to continue increasing the number of transistors or microprocessor clock rate. That is why researchers around the globe are exploring new possibilities. One of them is spintronics which makes use of electron spins and already has some important practical applications. Around the turn of the century, the use of giant magnetoresistance materials in magnetic field sensors (used to read data in hard disk drives) has enabled the storage of much larger amounts of data on HDDs. Researchers all over the world are working on new spintronic devices, and half-metals are believed to have great potential. They were first predicted based on computer simulations and later proved to exist experimentally. Unlike a usual metal, in a half-metallic material, electrons of only one spin orientation — e.g., spin up — participate in the electric current. As for spin-down electrons, their energy is too high, and therefore they cannot carry charge current. This means that when the current is passed through a half-metal, a spin-polarized current is generated as well. But spin-valley-tronics seeks to manipulate not only a spin-polarized population of electrons in the current but also the so-called valley index. The term "valley" is borrowed from semiconductor physics. Mathematically, the excitation energy in a solid is expressed by E? (k,?n), where k is the momentum of the electron and n is the zone index, i.e., a discrete quantum property of the state of the electron. This function may look rather odd, and in the case of several minimums with comparable excitation energies, one can speak of the presence of multiple "valleys." With certain reserve, one could say that electrons whose states correspond to one of the valleys do not interact with electrons from another valley. Such an ensemble of electrons can carry not only spin and charge, but also a distinct value called the valley index. The valley index can be used to transfer information with the help of valley currents — in this regard, the valley index is quite similar to spin. Research in this direction is currently being carried out by several groups, which implies that the ideas proposed in the publication are not pure abstractions. The idea of using the valley index is certainly not a new one, but what the researchers did is, they theoretically proved the existence of a novel class of materials for use in spin-valley-tronics. The half-metals available to the researchers all contain atoms of transition metals: nickel, manganese, or lanthanum, etc. The team of researchers, which included physicists from Russia and Japan, has demonstrated a theoretical mechanism for achieving half-metallicity that requires no transition metal atoms. This possibility would have a number of useful applications, including in implantable devices. The physicists suggest that "nonmetallic half-metals" be obtained from a special class of dielectric materials called charge- or spin-density wave insulators. The term charge- or spin-density wave refers to a state with periodic microscopic regions with nonzero average charge (spin) in the material. Theorists describe such systems as a quantum condensate of electron-hole pairs. For a pair of this kind to form, two valleys are required: One provides electrons, the other provides holes. It is the presence of two valleys in the original system that gives rise to spin-valley half-metallicity. In semiconductor physics, a "hole" is a quasiparticle that is considered to have a positive charge. For a material with a density wave to become a half-metal, it requires a special treatment known as doping. This involves the incorporation of electrons or holes into the insulator. Alexander Rozhkov, a co-author of the paper and a researcher at MIPT's Department of Problems of Physics and Energetics, explains that a system can be doped by subjecting it to an external electric field or chemical modifications of bulk or surface: "For each system, a suitable type of doping atoms — such as nitrogen, phosphorus, or some other element — needs to be selected. By replacing atoms of the host system with impurities donating or accepting conduction electrons, a change in the properties of the original material is induced." The possibility of doping materials with density waves has been discussed in the literature for a long time. Thus, among articles cited in the newly published paper are those dating back to 1970s. The systems dealt with by the researchers have been shown to have various phases, including spatially inhomogeneous (for example, states with the so-called electronic phase separation, and the phases with domain walls, often called "stripes"). Now, the unexpected discovery of two new phases — regular and spin-valley half-metallicity — has been made. Artem Sboychakov, one of the authors of the paper and a senior researcher at ITAE RAS, commented on the study: "In a way, our discovery proved to be a surprise even to ourselves. The physical model that, we found, has a spin-valley half-metallic phase is a classical one: It has been studied for decades. It would appear that Lenin, the revolutionary, was right all along when he wrote that the electron is as inexhaustible as the atom. It is now up to the experimenters: There are plenty of materials adequately described by the model we dealt with. I am therefore convinced that the phase we predicted will eventually be discovered, either in a material that is available today or in one that is yet to be synthesized." The fact that the paper was published in Physical Review Letters, which is among the most frequently referenced physical journals, is itself an indication of the importance of the idea put forward by the physicists from MIPT, ITAE RAS, and RIKEN. However, Kliment Kugel, chief research scientist at ITAE RAS, says there is more to it: "At a recent conference in Moscow, I discussed this idea with Sang-Wook Cheong, who is the director of the Center for Advanced Materials at Rutgers University, U.S. He is a prominent experimental physicist with an unmatched citation count; suffice to say that he authored about a hundred articles cited about a hundred times each. He liked our paper, saying that he rather enjoys pursuing specific materials that could realize properties predicted by theoretical physicists. Most of the time, he ends up finding them. Let us hope our case will be no exception."